A deeper look at the grooves pressed into the TX Jelly LP by The Texas Gentlemen. 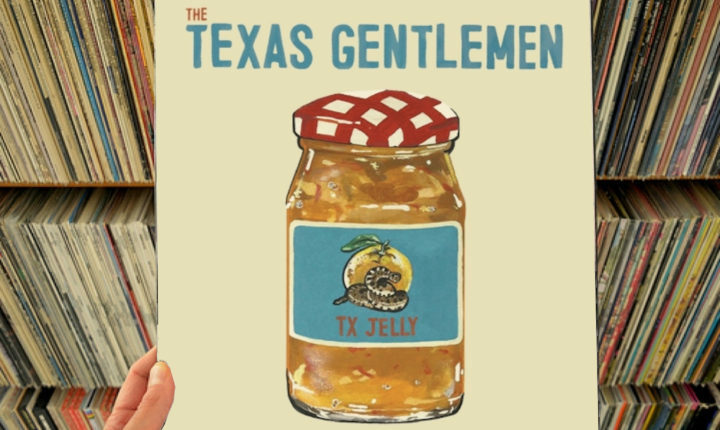 It might not be so easy for readers to remember now, but TX Jelly – the debut LP by Texas Gentlemen – actually springs from a tradition which once favored allowing an album to build and develop organically as musicians made it in the studio. Back before punk rock and all its myriad sub- and side-genres instilled a sense of brevity, “get in, get done and get out of the studio” prepared-ness and hard breaks between songs, it was common to hear one song segue and/or inform the next, or hear common elements manifest and push an album’s side along. The development and progression along through the side of an album felt fluid and fueled the notion that albums weren’t always intended to just be collections of singles; sides were intended to be taken as a whole in order to really enjoy the focus of the musicians and the development of both their inspiration and their music. That tradition doesn’t just manifest clearly on TX Jelly, it is a keystone for the album. On one’s first trip through TX Jelly, a listener with the right mind will be able to feel their excitement begin to swell involuntarily as “Habbie Doobie” begins to gel into a beautiful rock & soul jam to open the the album’s A-side. The way the song comes together really does feel off-the-cuff or written as the tape rolls; with just some spiritually intoned keyboard to open, the other players quickly organize themselves per leader Beau Bedford’s instruction and then lock into rhythm so easily that it just feels like a reflex action – like a thing they’ve done a thousand times before. That ease, finesse and style will make drop as it simultaneously instills a sense of awe; the song comes together effortlessly but, in listening, one nearly gets the sense that the players responsible for the magic aren’t even thinking twice – it’s easy because they’ve been doing it all their lives – this just happens to be the first occasion when there was a microphone pointed at it to catch it. The sense of ease and simplicity that governed “Habbie Doobie” endures (albeit with slightly less off-the-cuff caprice) through “Pain” – the song which technically follows it (although the two first songs on the album bleed together). There, perhaps because there is a longer lyric sheet (or perhaps because the song is half as long as its predecessor), one gets the impression that the band may have played “Pain” more than once before as the song structures prove to be tighter and more succinct, but that proves to in no way affect the overall vibe with which the song is playing. Here, the band keeps its twelve-bar blues form locked down tightly and placed at the forefront of the song which really helps to make it more instantly accessible than its predecessor was, and the comparative brevity of it keeps listeners’ collective minds from wandering. The same approach proves to true of “Bondurant Women” (which also manages to recall “Mr. Fantasy” by Traffic, somehow) before getting very “Texas Country” with “dream Along” and then switching emotional centers completely for the very “Old Country” nuance of “Gone.” There, Keite Young steals the mic and the rest of the band does their best impression of The Eagles for fun (truly – it really does feel like the whole band is hamming it up for grins here), but they still make it fun for listeners, instead of frustrating. Once again as the B-side opens with “Superstition,” Texas Gentlemen effortlessly reset the bar and prove that they’re capable of making (or mimicking) anything for as long as their attention spans endure. Here, the band sets up an angle which leans in the direction of Bowie’s soul dalliances from the Seventies but without the sci-fi undertones. Here, Jeff Dazey’s saxophone emotes better than the singer on the track (let’s be honest – you know the vocalist is making it up as he goes along when he delivers lines like “Do you believe in ghosts?/ Do you believe they can give you blowjobs?”), but that doesn’t detract in any way from the song as a whole – in fact, it makes for a great (if lengthy) introduction for the spectacular title track which follows it. There, Bedford’s keyboards give the song an understated swagger for the marching stomp of the drum pattern to play off of, and the while the track still feels a little underdeveloped, the combination of “Superstition” and “TX Jelly” at least introduces a playful side for the band which wasn’t accurately articulated before. After “TX Jelly,” the B-side does begin to sink under the weight of the kind of misery which can only be found in old school Country music (see “Pretty Flowers” – which sounds like it would have been better performed by Patsy Cline or Willie Nelson) before buoying back up with the fun/goofy and almost T. Rex-y rock grandeur of “Shakin’ All Over.” Undoubtedly the high point of the side, “Shakin’ All Over” manages to show some genuine rock grandeur and ferocity without abandoning the band’s obvious Country soul which leaves listeners hopeful that this might be the direction in which The Texas Gentlemen concentrate their efforts when they return to the recording studio to make a follow-up release. TX Jelly is out now. Buy it here on Amazon.